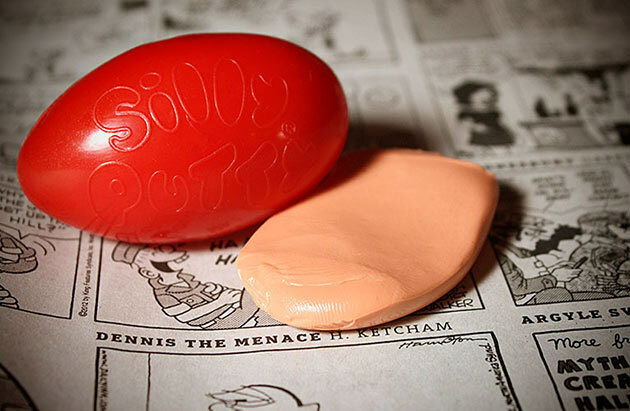 There is great debate in toy history as to who really invented Silly Putty. One thing is for sure: we can thank the American rationing of rubber during Word War II for its existence. The shortage of rubber was due to the Japanese invasion of many rubber-producing countries during that time period, which led the U.S. government to fund research into synthetic rubber compounds. James Wright, the man who was awarded the patent in 1943, discovered that reacting boric acid with silicone oil would produce a gooey, bouncy material with several unique properties. Although it never became a suitable rubber substitute, it eventually become known as Silly Putty. Interestingly, after his discovery, Wright sent samples to scientists all over the world, and not one was able to find a practical use for it. In 1968, Apollo astronauts took it into orbit to secure their tools in zero-gravity. Physical therapists use it for rehabilitative therapy of hand injuries. Amateur CSIs can use it to lift fingerprints. It can be used as a drumhead resonance damper. You can wrap it around a pencil and use it as a grip. Use a few balls of it to practice juggling. You can use a thin layer of it as a thumb cover for counting money quickly. Easily locate important items in your home (like flashlights or candles) during a power outage by marking them with the glow-in-the-dark variety. Wrap it around your soda can and it will keep it cold. Roll a ball of it on the floor to help find a lost contact lens. It’s great for removing hair and lint from your clothes. It can be molded into replacement dice for your favorite board game. You can use it to open a twist-top bottle without hurting your hands. It can be fashioned into a worm and used as a surprisingly effective fishing lure. Stick it under your dog’s bowl so it doesn’t slide all over the floor. It can also be sculpted into a boat for your pet hamster. Two lessons to learn here. First, Silly Putty is probably a good thing to have around. Secondly, and most importantly, just because someone “smart” says something is useless, impractical, or can’t be done, doesn’t necessarily make it true. Remember that next time someone describes something you’ve done as a dead end. P.S. Silly Putty is also one of the new cool things that you can add to a Build-Your-Own Adultitis First Aid Kit. Build yours today! Silly Putty doesn’t lift modern newsprint. :( Methinks some sad sad adultitis afflicted person invented modern newsprint. Hmmm…on the photo shoot I did, the silly putty transferred the comics just fine. Although the paper may have been a few years old. If you are right, this is heartbreaking news!! !